This would be a terrific Minimoog emulation at any price, but it's a steal for what you pay. It's too bad it doesn't integrate easily with most other apps, but if you're a live performer or a Tabletop user who's longing to add the classic Moog sound to your iOS rig, you'd be nuts not to buy it. That's a pretty faithful recreation of the interface, but does it sound as authentic as it looks? Just in case you don't think the iMini's sound is fat enough, you can thicken it with a chorus and add some atmosphere with the analogue delay clone. X/Y pads and an arpeggiator are added to the Mini's audio arsenal. Better than real knobs? Only you can decide. Here are the raw sawtooth waveforms of both the real Minimoog and the iMini. As you can see, they are almost identical, save for the fact that they are inverted! Fortunately, that doesn't affect the sound. The raw square waves of both instruments are very much alike with only slight differences. So another big-name plug-in developer jumps into the iOS fray, bringing with it an iPad-ready clone of one of the most beloved hardware synthesizers of all time. With a little help from Retronyms, Arturia's iMini comes in at less than ten percent of the cost of the desktop version and, as we'll see, offers features not found on much costlier virtual analogue emulations. That said, the basic architecture of the iMini offers few surprises. That's not a shock, really, considering that virtually every non-modular synthesizer made in the past 40 years owes its design to the Minimoog, the synthesizer on which it is based. You get a trio of oscillators, each offering six waveforms from which to choose. The third oscillator doubles as an LFO, but can also operate in the audio range for huge detuned sounds (all three oscillators can be switched to a 'lo' range). You can detach both oscillators 2 and 3 from keyboard control. The iMini has an added sync mode to lash the first two oscillators together. A mixer section enables you to switch each oscillator in and out as well as adjust their individual levels. Ditto for white or pink noise and external audio. All of this stuff can then be routed through the filter, a recreation of the famous 24dB Minimoog filter, in fact. You get cutoff and emphasis (that's Moog-speak for resonance) controls, and a knob to govern the amount of modulation applied by the filter envelope (called 'contour' after the Moog). Osc 3 modulation can be switched in, as can two levels of keyboard control. Just like the real thing, then. Also like the real thing is the self-oscillating filter. Shut off the oscillators, crank up the resonance and it'll churn out its own simple waveform, the pitch of which can be controlled by the filter cutoff and other modulators. Self-oscillating filters are all-too rare in software synths and we welcome its inclusion. The iMini's envelopes are the same three-stage 'contour' jobs found on the original. Attack, Decay and Sustain are here. Release time is determined by the Decay, assuming that the Decay switch is activated. That switch is hidden beneath a panel above the keyboard on the iMini (it was above the wheels on the real thing), as is the glide switch, an added legato switch and a means by which you can choose how the keyboard range is selected and the zoom level of the keyboard itself. As with many other iOS synths the iMini offers a wide range of scales and these are likewise selected from this hidden panel. The main panel is flanked by two sets of knobs. The Tune, Glide and Mod Mix knobs are on the left, while the main volume, chorus and delay amount knobs are on the right, along with a switch for activating polyphony. The delay and chorus effects are revealed with a button push. Three different chorus types with rate and depth controls are included, and the delay is a BPM-syncable analogue emulation with independent time and feedback controls for left and right channels. Yet another hidden panel provides a pair of X/Y performance pads, the vectors of which may be connected to the various front-panel knobs via a pop-up drag 'n drop interface. Additionally, there's a latching arpeggiator with the usual modes, along with BPM sync and a five-octave range. All good fun and not available on a real Minimoog. A further hidden panel is revealed by tapping the Connect icon. This brings up options for connecting with the world outside of iMini. Korg's WIST is here, enabling you to sync to other WIST-enabled apps on another iOS device. Simple MIDI connectivity is included and MIDI learn is supported, so you can control iMini over a wireless MIDI connection or from a hardware controller via the Camera Connection Kit. We do mean 'simple' MIDI connectivity, though: there is no way to change, say, the MIDI channel. Finally, as the iMini was developed with Retronyms, it's no surprise that it can act as a device in its Tabletop software studio app. In fact, that's the only way you'll get niceties like Audiocopy and Audiopaste or a means by which to record the iMini inside your iPad. At this point, Audiobus is not supported by either iMini or Tabletop. So how does the thing sound? Pretty damned good. We put it up against a real Minimoog Model D - perhaps an unfair contest, since the real deal costs a king's ransom on the second-hand market. Nonetheless, the iMini fared very well indeed. The sound is slightly more clinical than that of the Minimoog and, needless to say, matching parameter settings on the two does not produce exactly the same sound. However, neither would setting identical parameters on two different vintage Minimoogs. Surprisingly, the iMini seems to do its best work in the low end, emitting a pretty close facsimile of the Minimoog's legendary bass sound. Up high, it's a little more precise than our Model D, but a few knob tweaks bring the sound into line with the real deal. It isn't a perfect match - but we didn't expect that it would be. The filter resonance has a more drastic negative impact on the overall volume level than it does on our Model D. And, as is often the case, the behaviour of the envelopes differs from the vintage variety. However, the iMini offers a closer match than many software clones out there, desktop or tablet. This shouldn't be too surprising - later versions of Arturia's MiniV are similarly authentic and the iMini shares the same architecture - in fact, patches created on one are compatible with the other and the iMini comes with hundreds of sounds from Arturia's patch archive. Here, we've matched the parameter settings as closely as possible between our real Minimoog Model D and the iMini. We've recorded a bass sound and a lead sound, with the real Mini playing first, followed by the iMini. As you can hear, they are quite similar, though there is a distinct difference in the sound of the resonance and the envelopes. With a bit of tweaking, they can be very close indeed. 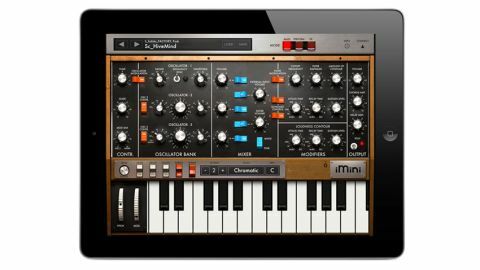 The price makes iMini a no-brainer for vintage synth fans, particularly for those of you who use Tabletop (a free app these days, we hasten to add). It should be noted that iMini is strictly monophonic when used in Tabletop - a limitation made to ensure that it doesn't eat up too much CPU power. Even so, a pair of iMinis kicked the CPU consumption up to 50% in Tabletop on our aging iPad 2. Performing musicians will love iMini on their iPads. Those of you who use your tablet as a DAW might find it a bit of a hassle to get its sound into your studio app of choice until some manner of copy/paste or Audiobus support is added, but Arturia and Retronyms have done a superb job bringing this instrument to iOS. Now here's hoping for an iOS version of the ModularV!